The main objective of the Linguistic Consultancy Office of the ILA is the study of communication strategies and its types. As part of the office, ILA has an approved linguistic consultancy service, for, not only, the University but also for the rest of society. This service includes text proofreading in Spanish and English, linguistic consultancy in communication issues in a variety of fields (executive, corporate, politic, technical-scientific, doctor-patient interaction or mass communication) and analysed from different perspectives (social, pragmatical, psychological or anthropological), as well as linguistic and intercultural mediation. The office also organises a variety of courses, workshops, and specialised seminars in companies, technological centres, and official institutions aimed at the education of linguistic proofreaders and business communication. 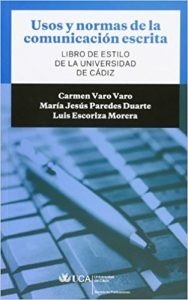 These activities lead to publications such as the University of Cádiz Style Guide.